I had mixed feelings reading Jim Pritchard’s review of Royal Ballet’s Swan Lake on 17.03.2015, Natalia Osipova, Matthew Golding and Gary Avis in the leading roles. It could be a good feeling, to know that other ballet-lovers see what I see – only I wish we were wrong, because such waste of talent, in such costly productions, makes me sad. And angry. All aspects Pritchard mentions are in tune with posts in this blog: the garish, cluttered scenarios (see Swan Lake turned into Theatre); the fact that Siegfried has no opportunity to dance (see Graceful Dancers Part 2); Natalia Osipova, despite outstanding technique and careful acting, being unable to create “magic” (see Graceful Dancers Part 1, and About Kings, Battles and Muses...); about Matthew Golding’s bad acting, resulting in a pale performance compared with Ivan Vasiliev’s Siegfried (see Ivan Vasiliev Acted Socks Off); the damping down of individuality by excessive coaching, in a misguided effort to keep Dame Fonteyn’s style alive forever (see I will write a lot about Ivan Vasiliev); the fact that men who are not dancers run away from ballet performances – what kind of “art” is this, that pleases mostly women and old people, having no interest for others? (see Dance, know thy Audience). He does not mention, however, the dreadful, excessive mime, but I will! Last act is available on the web, you can judge for yourself. 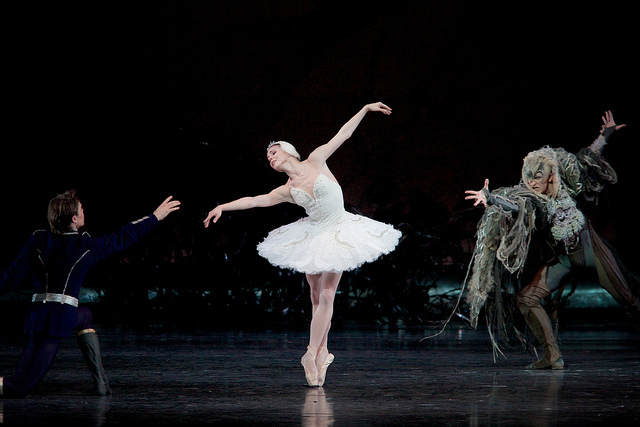 [[ LINK TO ROYAL BALLET’S SWAN LAKE, Last Act). 4th Act has such an overload of mime it turns real acting into an impossibility! Osipova dutifully uses all prescribed (exaggerated) facial expressions and movements, but they are a poor substitute for the real thing. I wish she would rebel… She stated, during rehearsals, that she was “still looking for his (Matthew Golding’s) soul”, indeed! How would she find it, if she did not allow her own soul to be there? Ill-guided, misused, under-used, all these fabulous artistic and financial resources. How much longer will audience be forced to look for (empty) movements -“athletic delivering”, “beautiful lines” and “whipping 32 fouettés” – as the best you can get out of a performance? I may be right, but there is no self-satisfaction in the notion – I would much prefer they had proved me wrong.